'Redwyne' ( William McKee, R. 1944) TB. Midseason bloom. Color Class-R7D. ((( 'Christabel' x 'Tenaya') x ( 'Janet Butler') x ( 'Red Comet'). 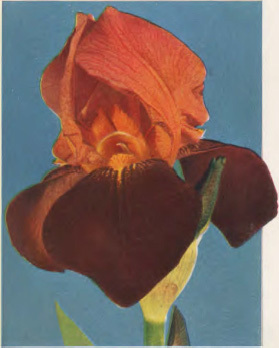 From Fairmount Gardens catalog, 1945: REDWYNE (McKee 1945) M. A deep mahogany red self that is outstanding in its color class. Described by one prominent iris judge as having "a patina warm and glowing enough to attract the attention of an antique dealer." The medium sized flowers have an unusual velvety richness, devoid of venations, and the solid color gives it great carrying qualities in the garden. I like the color of this neat trim flower better than any red iris I saw last year. H. C., A. I. S. 1944. R.89, 1944. 36 in. $15.00.